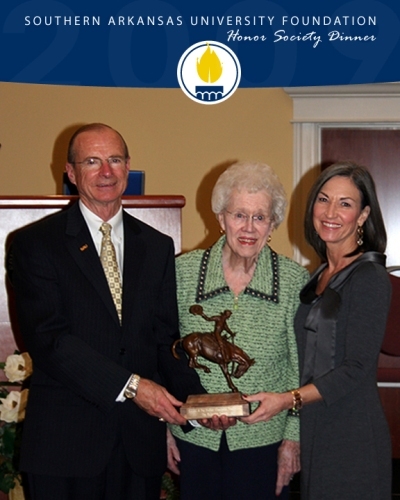 Pictured above are Dr. David Rankin, SAU President, presenting the Mulerider Society Award to Mrs. Pat Walker and Ms. Debbie Walker of The Willard & Pat Walker Charitable Foundation at the 2009 SAU Foundation Honor Societies Dinner. The Mulerider Society recognizes those who, through contributions to the SAU Foundation, support any area of the University by making cumulative contributions of $500,000 or more. The Willard & Pat Walker Charitable Foundation, through two grants to the Mulerider Baseball Program, has gifted $660,000 to benefit Southern Arkansas University and its students. Mr. and Mrs. John Rhea, Jr.